In 1933, as part of the New Deal instituted by the Roosevelt Administration to help lift the nation out of the Great Depression, a public works agency called the Civilian Conservation Corps was created. Like all of FDR’s initiatives, it quickly became known by its initials, the CCC. It was created to provide work for young men and gave them a monthly stipend, housing, clothing, and food. In return the CCC completed improvement projects in America’s publicly owned lands, many of which remain visible and valuable more than eight decades later. It was widely popular in its day and remains one of the most successful government programs for the conservation of natural resources ever created. The CCC was a temporary program, funded annually by Congress out of money allotted for emergency programs. By 1942, the need to provide funding for young men of the ages accepted by the CCC was supplanted by the expanding Selective Service System and the CCC was disbanded that year. In the nine years the program operated, it planted approximately 3 billion trees in America’s public lands and improved rural roads, national, state, and community parks, built hiking trails, constructed campgrounds and park facilities, and left a lasting mark on America’s recreational and rural lands. It operated separate programs for both veterans of the World War and Native Americans affected by the Great Depression. Here is its story. On March 21, 1933, after just over two weeks in office, President Franklin D. Roosevelt sent a proposal to Congress, asking for the creation of an agency modeled on a similar, though smaller, scale as one he had started when governor of New York. Roosevelt suggested that the new agency would operate while “confining itself to forestry, the prevention of soil erosion, flood control, and similar projects”. Roosevelt informed Congress that the work of his new agency was of “definite, practical value, not only through the prevention of great present financial loss but also as a means of creating future national wealth”. At the same time, it would provide work for unemployed and unemployable young men. Ten days later, Congress passed the Emergency Conservation Work Act (ECW) by a voice vote, providing the president with the funds necessary to implement his vision. FDR issued Executive Order 6101 in the first week of April, creating the Civilian Conservation Corps. The CCC was operated by four government agencies. The Labor Department hired the men to staff it. The War Department was responsible for the operation of the work camps to be built to house the men. The Departments of Agriculture and the Interior were assigned to create the projects and supervise their completion. 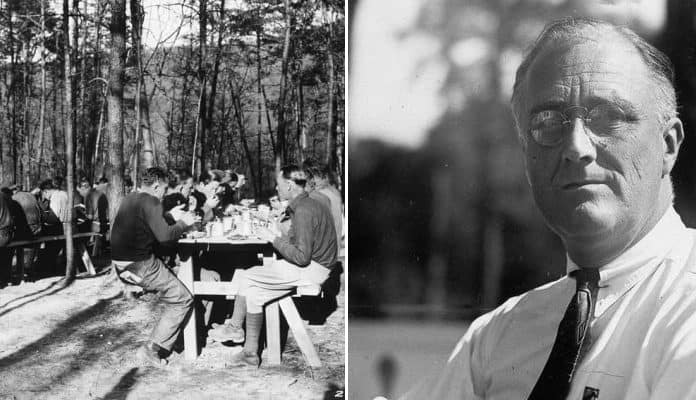 On April 17, less than one month after FDR first proposed the organization, the first camp opened near Luray, Virginia, in the George Washington National Forest. It was named Camp Roosevelt.